Reduce your Healthcare Costs with Wellness Incentives! Combating the high cost of healthcare is a major challenge for small businesses with limited resources. However, employing a small number of workers can also be an opportunity to tailor a wellness incentive program to the specific needs of the organization and its employees. Small businesses can spend little budget and time polling employees on wellness program expectations. Additionally, having limited resources can inspire creative wellness incentive solutions that are rewarding for participants. In the past year alone, healthcare costs have increased by 5%. The impact of implementing a wellness program that improves the health and well being of workers can benefit a small business in many ways. From higher employee engagement and retention to lower healthcare costs and absenteeism, wellness programs equal dramatic cost savings for small businesses. A design firm asked Awards Network to implement and administer a wellness incentive program to its 50 employees. Awards Network created an online wellness program that allowed employees to read health and wellness information, learn about the goals of the program, view their points earned and browse the online award catalog. Once a month, employees were invited to take part in a brown bag lunch followed by a 20 minute promenade. Throughout the wellness program, participants got in the practice of completing monthly HRA quizzes online, cooking the weekly healthy meal idea and making appointments with physicians for annual physicals. 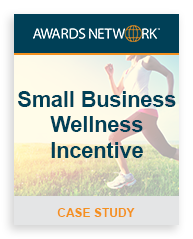 From awarding points and reporting on the wellness program success to gift fulfillment, all aspects of the online wellness incentive program were managed by Awards Network. Want to learn more about wellness incentive programs? Contact Awards Network to discuss how our award programs can work for your small business.